Archive In the media | Who's afraid of Shen Yun? Here’s a radio interview I did with Australia’s Susie Elelman in Australia ahead of our Sydney performances there. Susie was wonderful to talk to, and we dove into some deeper issues such as what the persecution of Falun Gong is about, how it’s represented in the performance, and some other things as well. Not bad for an interview recorded at 3am. You can also read a transcript of the interview. Congratulations to Ethan Gutmann on publishing is monumental The Slaughter: Mass Killings, Organ Harvesting, and China’s Secret Solution to its Dissident Problem. This book is, in spite of its daunting title, a good read and a page turner. It’s narrative nonfiction at its best, and if you’re familiar with Gutmann’s other writings you know what I’m talking about. It’s also the best place to go for a third-party, investigative journalist account of Falun Gong – the practice’s rise in popularity in China, the early signs of oppression, the crackdown, the brutal persecution, and courageous resistance. It is only the only account to place the horrific practice of harvesting organs from Falun Gong believers in recent historical context, going back to practices uncovered in Xinjiang. This book is a product of years of research that I had the honor to be a part of as Ethan’s assistant and translator. Ethan is a kind but hard nosed interviewer who asks tough questions. His inquisitiveness drove our entire research process, which took us all over the world. It is a definitive book on organ harvesting written by a man who initially was not convinced it is actually taking place. But we had access to exclusive interviews with former Chinese policemen, medical personnel, refugees who escaped labor camps so recently they still had healing wounds, and many other people who took great risks to talk to us. This is their story and it is one you will want to know. A landmark court ruling on March 9 in Hong Kong has successfully overturned the Immigration Department’s decision to refuse entry of key members of the Shen Yun Performing Arts company last year. The decision was an encouraging step toward ensuring cultural freedom and curbing the power of the Immigration Department, said Chairperson of Hong Kong Human Rights Monitor Chong Yiu Kwong. The legal case was filed by the Epoch Group—the local presenter of Shen Yun—against the director of Immigration, after he refused six members of the company entry to Hong Kong just seven days before the shows were due to commence in January 2010. The Epoch Group also publishes the Hong Kong edition of The Epoch Times. The New York-based Shen Yun, referred to as the world’s premier classical Chinese dance company, was invited by the Epoch Group to perform seven shows at the Lyric Theatre Jan. 27–31, 2010. Shen Yun master of ceremonies Leeshai Lemish also said that upon the cancellation of the show audience members who planned to travel to Hong Kong from mainland China had their tickets confiscated by authorities and some were even arrested. According to its website, Shen Yun’s mission is to revive traditional Chinese culture. It has been invited to perform at some of the world’s most prestigious venues, such as the Lincoln Center in New York, the Kennedy Center in Washington, D.C., and Palais des Congrès in Paris. The organizers said that the performances were completely sold out within days of the public ticket release. The sudden visa cancellation forced the organizers to refund over HK$5 million (US$642,000) to the public in lost ticket sales, said Mr. Kan.
“We were shocked by the director’s decision. The refusal to allow key production staff into Hong Kong just days before the shows was clearly a premeditated action to sabotage the show,” he said. “We welcome the court’s decision, and we thank all the righteous support from Hong Kong and overseas, and praise the court for being able to clear the obstacles,” said Mr. Kan. In Hong Kong there are no specific visa schedules for visiting artists or sports teams. Such groups have to apply under the so-called GEP schedule, known as General Employment Policy. The provision essentially requires the applicants to prove the necessity for “employment” and that their work cannot be performed by local experts. While in most cases such proof is not enforced, the final decision has been left to the director of Immigration, whose powers remained largely unchallenged. This latest court decision by Judge Andrew Cheung has created an opening for greater discretion, says To Yiu Ming, assistant professor, Department of Journalism, Hong Kong Baptist University. “I feel that the court’s decision respected art exchanges [and] has a positive effect on cultural exchange in future,” said Mr. Ming. “This is a testing case to see if the court is really independent,” he added. One unique feature of the Shen Yun performances is the use of state-of-the-art technology to project digital backdrops, often synchronized with the dance performers. The court documents from Judge Andrew Cheung cite evidence the six visa applications were denied to the staff that was specifically responsible for technical support and back stage assistance, in particular lighting, sound, and projector operations. In other words, the visa applications were refused on the grounds that the staff can be replaced by local engineers. The reasons were refuted by the applicant’s lawyer, Mr. Paul Harris. “The decision to refuse all production staff … ignores the simple fact that being able to operate the lighting [and] sound effects of backdrop for a stage event is not a matter of knowing how to operate them, but a matter of when to operate them,” argued Mr. Harris. The Epoch Group plans to reinvite Shen Yun to Hong Kong as soon as possible, says Mr. Kan. The government can appeal the court’s decision within four weeks, but some feel that will be unlikely. “I can tell you, he may not dare to appeal after going through the verdict,” said Albert Ho, leader of the Democratic Party. Mr. Ho believes the verdict re-established Hong Kong’s values. Have you ever waited at an airport for a loved one you have not seen in a long time? Surely you remember the giddy expectation, scanning arriving passengers for that familiar face. But what if your loved one never arrived? My husband never turned up. On Feb. 18, I waited for him at Newark International Airport with flowers. It had been over three years since I last saw him before fleeing China. Jiang Feng was to arrive on a Continental Airlines flight from Shanghai, but after the last passengers left he was still nowhere to be seen. My calls to China confirmed my greatest fears: He checked in, but never boarded the flight. Chinese secret police abducted him. We married 12 years ago in Anhui province. I was a musician and he worked as a piano tuner. But before our first anniversary we were kidnapped from our workplaces and jailed. That was July 20, 1999, the first round of arrests of Falun Gong practitioners like us. Our worlds collapsed as the campaign rolled in with a force equal to that of Mao Zedong’s Cultural Revolution. Suddenly, we were enemies of the state, cut off from our family and friends. We were arrested for practicing meditation and following our discipline – principles of truthfulness, compassion and tolerance. Falun Gong was becoming too popular for the Communist Party’s liking and our crime was having an independent belief system. As I was a prominent musician, my director pulled strings to get me out, but my husband was jailed for three years. In 2002, literally days before his release, I was standing on a sidewalk when plainclothes police suddenly shoved me into a taxi and drove me to a detention center. They imprisoned me for four years. I was tied to a chair for 75 days without being allowed to sleep or use the restroom. My fingers and feet swelled three times their size. I was electrocuted, beaten and repeatedly knocked unconscious. I watched my friends, one after another, take their last breaths. Somehow, I survived and, after being released in 2006, fled to the United States. My husband and I planned to reunite here. After I was generously granted political asylum, he also received the status of “derivative asylee,” obtained a U.S. visa, packed his bags and checked in at the Shanghai Pudong International Airport. He would have been with me in Washington this week, as thousands of Falun Gong practitioners from around the world mark yet another anniversary of persecution in China. Instead, he is in an Anhui province labor camp in which prisoners toil in a coal mine. In addition to torture, my husband now faces the dangers of being trapped, suffocated or crushed underground in China’s most fatality-prone work. Many people think the persecution of Falun Gong is mostly a thing of the past, a blotch on China’s slow but steady progress. Quite the contrary. In the months before the Olympics, over 8,000 practitioners were arrested, often from their homes for no apparent reason other than their faith. Many were sent to labor camps for periods far exceeding the length of the Olympic Games. Last year saw an upsurge in sham trials with hundreds of Falun Gong practitioners sentenced to prison for up to 18 years, often simply for downloading an article or distributing leaflets exposing persecution. My husband and I were wed 12 years ago but, separated by persecution, we have shared married life for only a few months. I am extremely worried about his safety as I know what he faces every minute. As you notice the Falun Gong activities this week, please remember that these victims of oppression are real people. They are our husbands and parents and children. They need your international voices of support. We have seen how, when the world looks away, we face the darkest pitilessness of the Chinese Communist Party. Your direct, public statements of support have a great restraining effect. JURNAL TV morning talk show part 1 part 2 part 3 – interviews with hosting organization representative, Shen Yun performers, the minister of culture, and the theater director. 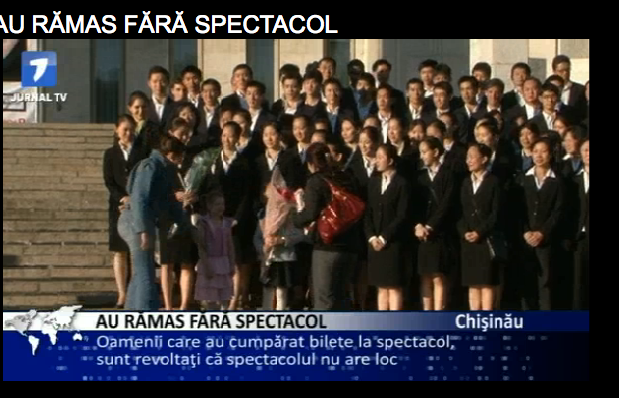 Falun Dafa Association in Chisinau asks for explanations from the Moldovan Government regarding the illegal actions taken regarding the company Shen Yun Performing Arts from New York. 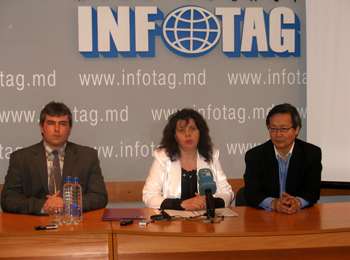 The president of the Association, Tatiana Chiriac, mentioned on Thursday, during a press conference at INFOTAG agency, that the performers arrived in Chisinau for presenting a show of Chinese classical dance, on 25 and 26 of May, at the National Theatre of Opera and Ballet. According to her, Falun Dafa Association signed a rent contract for 25 and 26 of May.